Giving wine as a gift can be a nerve-racking experience, so many choices to pair with individual preference. Wine is a gift than can illicit a huge amount of joy because so much care and consideration is required to find that perfect bottle, the one that lights up a face, and at the same time manages to express something personal about your relationship. Flagstone has a particularly special bottle of wine that reflects craftsmanship, care and creativity, a wine that’s an authentic consideration of provenance and a skilful representation of character. Made from three vineyards in different cool-climate regions, Velvet Blend is a decadent expression of Shiraz, Mourvedre and Viognier. Alluring top notes of cinnamon and spice above a concentration of intense dark red berries cloaking the dark, ripe aroma of soft black plums. The velvety smooth tannins court a burst of red berry and cherry on the palate followed by an intriguing hint of smooth dark chocolate. 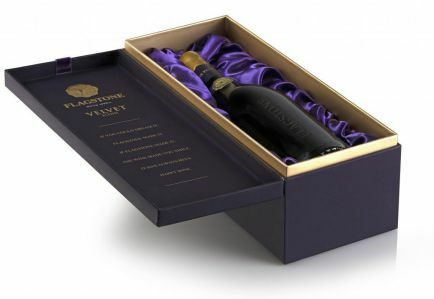 Velvet also looks the part, housed in a plush purple gift box it’s a luxurious present for a loved one. Just make sure Santa doesn’t spot it first, rumour has it he carries a corkscrew. Previous Post Aunty Merle is back in Jozi in February!